TopoSurv imports survey data from the instruments and reports the data in a survey document where all types of data is reported in different tabs. Survey data, known points, local coordinates, satellite data in latitude, longitude and height as well as satellite data in vector from base station. To make data accessible in ArcGIS the surveyor will use point codes to create layers – tables and there are numerous ways to create geometry for the survey. We recommend to use control codes that gives several choices of not only measure points and lines but also radius, parallel lines, circles and others. TopoSurv works also with attributes all the way from field to database. The result of a calculation ends up in a drawing sketch, a graphical view of data where data already is divided in different layers and it is possible to highlight different kinds of information about the objects. In the graphic view there are a few commands, two of them is for mean point calculation. One mean point calculation checks for points within a tolerance in the sketch, the other mean point calculation will also check for points within the tolerance from the ArcGIS database. If so you may decide what to save, i.e. you can save the most of the attribute values from the database point, receive new coordinates from the measured mean points and perhaps update one or few attributes as “METHOD”. In the survey sketch it is possible to edit layer name for the objects and there are a specific function to change all objects to construction layers, a way to edit them later in ArcGIS. The save function to ArcGIS tell you how many objects will be saved in each layer/table and if these objects are new or modified. Are there objects in the surveying sketch that cannot be saved in the database because of wrong layer names you will of course have a warning about this. There are a specific command from ArcGIS to select points for use as known points in TopoSurv. Stake out data can be sent directly from ArcGIS via TopoSurv for export to the different field collectors/instruments. TopoSurv is a product from Adtollos Topocad that has been on the market since 1995. It is a well-used and proven system with thousands of users in 100 countries. 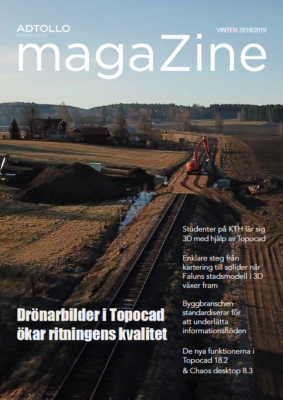 TopoSurv is developed together with the Swedish Land Survey who has made the ArcGIS Components.